Entertainment was abound at the Greek Festival . 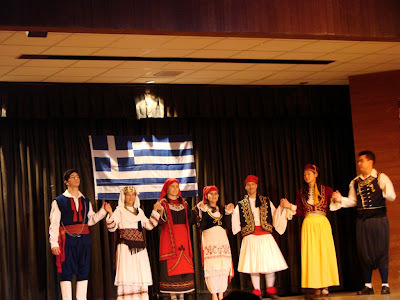 Here is a photo of the Nisiotes Dancers who performed a variety of Greek fold dancing in colorful regional costumes. Accompanying them was the Nisioupoula “Little islander” Dance Group. Also performing at the festival was Fotia a Greek band from California and the renowned guitarist Sotos Kappas. One of the most famous food items at the Greek Festival 2010 at McCoy Pavilion in Ala Moana Beach Park is the Gyro. 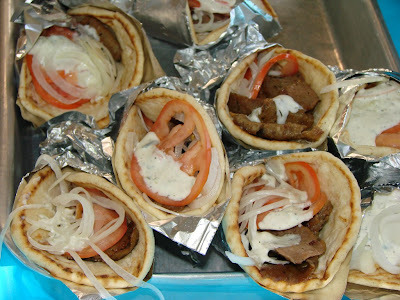 The Greek dish consists of meat, tomatoes, onions and a tzatziki sauce (yogurt based) served on a pita bread. The meat (usually a beef lamb combination is cooked on a tall vertical spit and sliced into thin crispy shavings. 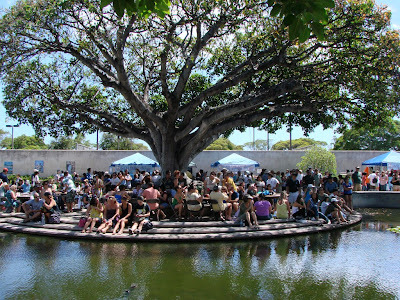 We begin our look at the 2010 Greek Festival at McCoy Pavilion which is a part of Ala Moana Beach Park. If you haven’t been there yet head out there today (Sunday August 29) as the festival runs from noon to 8pm. Tons of Greek food, dancing, entertainment and of course the very popular pastries. Click here for more information.